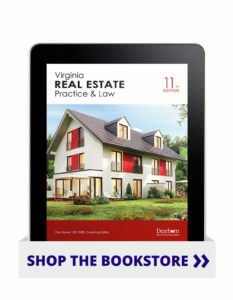 This supplemental text covers Virginia real estate license law and regulation. It is designed to be used with our national prelicensing texts and the Virginia Real Estate PSI Exam Prep QBank for complete preparation for the state licensing exam. The text has been updated with the latest information regarding agent relationships and the most current disclosure forms. With over 200 questions, students can test their retention of the material and readiness for the exam.